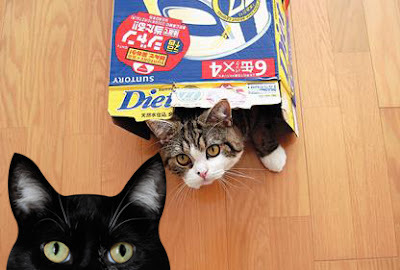 I saw a lot of videos I've featured on my Sunday Catinee on both lists! That must have been so much fun to attend - my human was envious! Oh wow. We didn't even know such an event existed! I'll bet it was a wonderful event! And hooray for your honorable mention. I am proud of Henri, his videos are so cool... and filled with ennui. Wow, so cool! And congrats on being an honorable mention, Katie...though we do think you deserved to be in the main event! An honorable mention--that's pawsome! Something to celebrate. I heard about this event on the radio! I wish I had been able to attend. 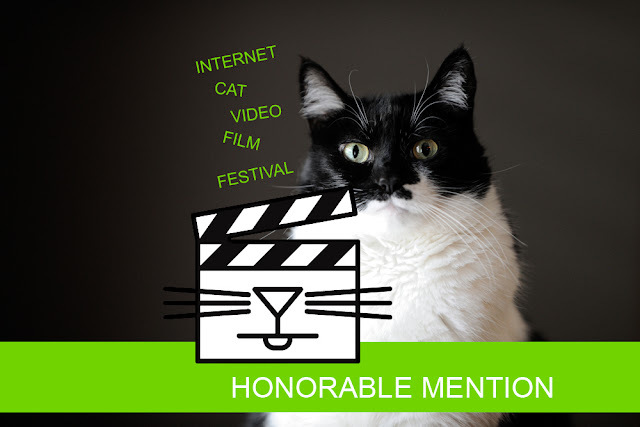 Your Real Housecats video is hilarious and congrats on the honorable mention! Can't believe the size of the crowd. I should've sent Plush CK. Concats on the HM even if I just make a cameo. Gotta say TW LOVES the keyboard cat. Glad Glogirly had a good time. This Brit is gobsmacked that so many people would attend such a event!!! There is hope for humankind yet!! Bravo you two, that is great to get an honorable mention! What an amazing event! OMC we are so proud of you, Katie...we hope you'll remember us when you storm Hollywood! 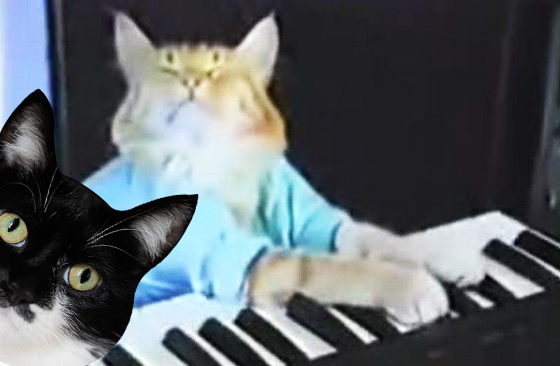 oooooh, Katie vs. keyboard Cat: The MATCH OF THE CENTURY - yeah, we'd like to see that! 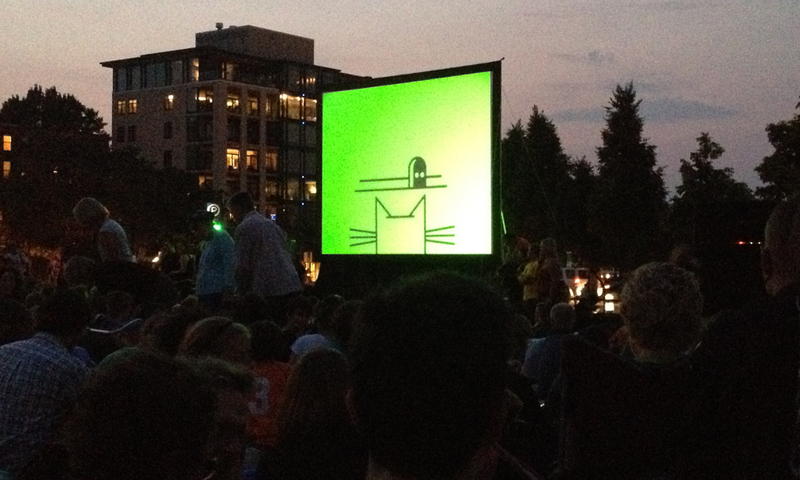 Concats on the HM! Looks like tons of fun was had by all. ANd Faraday wants to know why humans chanting CAT-CAT-CAT is such a big deal. Shouldn't they always say such things? We'll have to watch the program later at home! my stars katie, sure maybe henri has it going on and he's a handsome lot and maybe his video took first place but WHERE in the title" first place" do you see the word HONORABLE . Concatulations on being recognized! That's fantastic! WOW! i wanted to go but didn't make it over. 10,000 people... wow... honorable mention is nothing to sneeze at, or urp up a hairball at for that matter. Congrats on getting the honorable mention. That Henri video is very good. That must have been fun to go to that event. Have a terrific week end. We're sure like many talented artists you are just ahead of your time Katie and GG!! Congrats Katie! Thanks for letting me in on your ride to fame! That is very awesome about your Honorable Mention. Of course we believe you should have been Grand Prize but we expect the judges didn't quite now how to respond to something like your videos, they are so creative. We DO love Henri too! Noooooo! You might not know this, but the last place I lived I had a very very nice friend. He would come visit all of us kitties and spread all the gossip (no woofies allowed in the building except service dogs), and always try to make us purr softly before he left. And his name is Mr. Squirrel, and somebody cut half his tail off, and he was very very nice anyway. I miss Mr. Squirrel a lot. Even the beans in the building liked him, and fed him peanuts all winter long. So remember my Mr. Squirrel the next time you see one. Make friends! Ask Glogirly if she saw him. That's the old neighborhood, by the Walker. We TOTALLY think Katie shoulda been in the MAIN PROGRAM!! But we'll probably watch it all anyway sometime this weekend. It must have been fun to be there! We are so impressed here. Katie, why on earth would YOU care what a bunch of people thought about your video. You know it is #1 amongst us cats and does anyone else's opinion matter? Just read the new in the paper...old fashioned, I know!! Incredible! 10,000 people!!! 10,000!!!!!! Last night I finally found the current City Pages (we're out in the northern 'burbs remember) with the cat festival featured on the front and you on the inside!!!! Congrats on the honorable mention too! Be patient dear Katie! (Do you possess such virtues? )You will be more famous, on major newspapers,networks, etc! We just posted a brief summary of the festival and included your video Real Housecats. Concatulations on your Honorable Mention! We know you'll win that Golden Kitty. Just make sure your middle name is not Lucci. 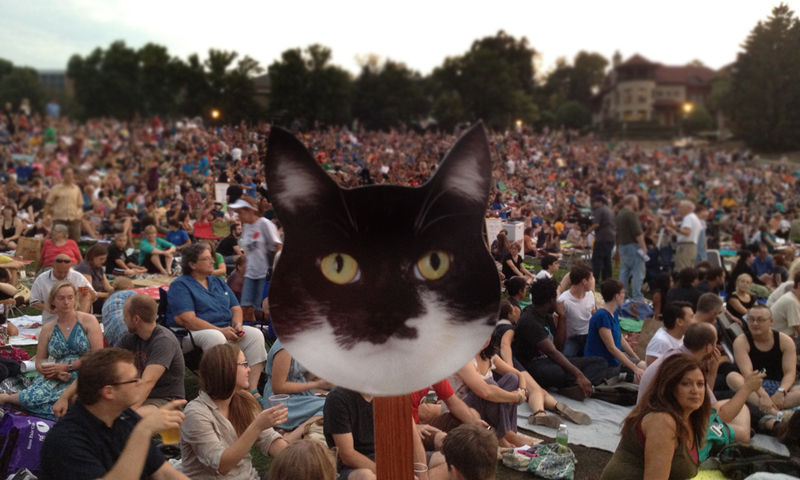 I honestly thought of flying there for the festival since it was an inaugural event regarding cats but the date escaped my memory. Maybe next year. I would be proud to hold your Golden Kitty during your acceptance speech.